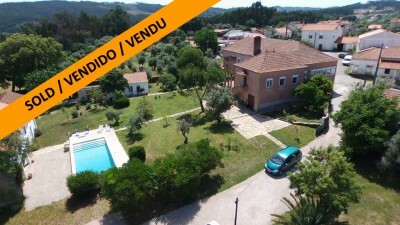 A nine bedroom detached manor house with swimming pool, land and outbuildings for sale near Alvaiazere, central Portugal. The property, which is set over two floors, is in a relatively good condition and would be ideal for someone looking to create a bed and breakfast style accommodation. The property, which is connected to both mains electricity and water, measures 1,349 square metres of construction and has land measuring 14,340 square metres. The manor house is fully double glazed with stone door and window surrounds. The property has air conditioning fitted to some of the rooms. The property has been updated though the owners have been careful to retain many of the original features including decorative wooden ceilings, parquet flooring and wooden floors. Though the manor house is set over two floors, the living accommodation is situated on the first floor. The main entrance to the manor house is accessed via a half stone staircase to the front of the house. There is a double opening entrance door which leads into a spacious hallway, which has a wooden floor and ceiling. The entrance hallway leads onto a secondary hallway, which runs the length of the manor house. This hallway also has a wooden floor and decorative wooden ceiling. There are nine bedrooms, all of which have wooden floors, four of which are parquet. Two of the bedrooms are double aspect. One of these bedrooms is a master suite, complete with bedroom, study room and en-suite bathroom. The en-suite bathroom has a shower, wall mounted toilet and vanity basin with storage cupboard beneath. The manor house has two living rooms, one of which is double aspect with traditional style ‘Marquise windows’. The other living room has a wall of windows and a large, traditional style stone fireplace with recirculating hot air Salamander installed. This living room provides access to a spacious kitchen, which has a range of built in base level stainless steel units with wooden work surfaces. The kitchen is fully equipped and has an electric hob, oven, dishwasher and fridge freezer. There is a second kitchen, at the opposite end of the manor house, which has also been refitted. This kitchen has traditional style partially tiled walls, built in base level shelves and a stainless steel sink and drainer as well as fittings for dishwasher and oven. This kitchen has a small dining area attached. The manor house has three main bathrooms, all of which have been refitted. The first bathroom, which is spacious and partially tiled, has a hydro-massage bath, separate shower cubicle, toilet, bidet and stone basin mounted on a shelving unit. The second bathroom is also partially tiled and has a toilet and wall mounted sink. The third bathroom is spacious, partially tiled and has a bath with shower fitment, toilet and vanity basin with traditional style dressing unit below. There is a third hallway, which provides access to the second kitchen, two bathrooms and two bedrooms. This hallway also has a wooden floor and ceiling and a part glazed exterior access door which leads via a staircase to the garden area. There is also tenth, single bedroom, which is being used by the current owners as a study room. Opposite this bedroom there is a wooden staircase which leads to the ground floor accommodation and to the large, spacious attics. The attics are spacious and have wooden floors and wooden beamed roofs. At present the attics are only used for storage purposes, though with a little work could be converted into additional bedrooms if required. The ground floor of the property is also only used for storage purposes at the present moment, though could also be converted into guest accommodation relatively simply. To the ground floor there are three large storage rooms, each with exterior access doors. Traditionally these rooms were utilised for storing wine and apples from the land. There are three large garages to the ground floor, all of which have exterior metal vehicle access doors. The garages are connected internally and have a concrete floor and ceiling and have powered installed within. Adjacent to the garages there is a covered, gated driveway which provides access to the manor house’s gardens though there is also a gated driveway to the side of the property. The property also comes with a large detached barn, which is set over two floors and a single storey cottage and a ruined cottage. The barn, which is in relatively good condition is being utilised by the current owner as an exterior entertainment area with tables and chairs set out under cover. The barn has a concrete ground floor and is open fronted. The first floor is wooden and the roof has wooden beams. The cottage, which has been restored, is double glazed and currently one open space. The cottage has a wooden beamed roof and ceramic tiled floor. The cottage has a set of glazed patio doors which lead out to a private garden area at the rear. There is also a glazed entry door which provides access to the swimming pool area. The ruined cottage is also set over one floor and traditionally housed the property’s bread oven. This cottage is in a bad state of repair, though could be reconstructed to provide additional accommodation. There is a 10 x 4 metre swimming pool situated in the centre of the u-shape of buildings. The property is situated on a plot measuring 14,340 square metres, all of which is relatively flat. There are an abundance of mature apple trees as well as olives, palms, Cork Oak and pine trees on the land. The property is situated in a quiet hamlet of Aveleira and is only a short drive to the market town of Alvaiazere in central Portugal. Alvaiazere has several mini-markets, cafes, shops, banks, health centre, school, library and post office. The larger, historic town of Tomar, which is home to the UNESCO listed Convento do Cristo, is around 25 minutes drive from the property. Tomar has a variety of supermarkets, shops, restaurants, cinema, swimming pools, sports centres, vineyards, historic monuments, bus and train station, art gallery, hospital, university and banks. The property is in good condition and would be ideal for someone looking to start an accommodation style business given the size of the manor house and it’s grounds. The manor house is in close proximity to a variety of local attractions including Portugal’s large cave system, the sanctuary at Fatima, Roman ruins at Conimbriga and Coimbra. The closest airport to the property is situated at Lisbon, which is around one and three quarter hours’ by car. Lisbon is serviced by a variety of low cost airlines which operate regular flights into and out of the United Kingdom and other European countries.